Remember that book cover that I drew and colored a lil’ while back? It’s out! 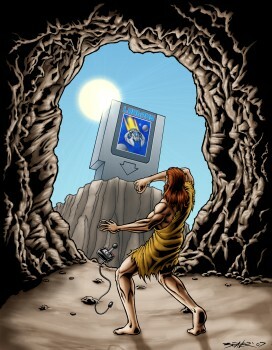 Memoirs of a Virtual Caveman is a book by Rob “Dire 51” Strangman, the creator of some great video game-based sites including the mighty OPCFG, the West Mansion Splatterhouse shrine and the Ghoul Realm that pays tribute to Capcom’s G ‘n G games. It’s full of real-life video game stories that kick off from the Atari 2600 days up until the beginning of the Playstation 1 era. Many of the articles I’ve read about the early days of video games miss the mark by a mile because there’s a lot of stuff that no one remembers until they start telling stories from back then. I’ve only seen some of the stories in their early forms and even then they were fun to read. Some will make you nod or smile as you remember a similar experience and others will make you twitch with envy (especially if the duffel bag story is in there). Rob and those who contributed stories to the book worked their butts off to bring you some true wayback action in book form and I hope you give it a shot. Plus, I drew the cover, so I did a lil’ bit, too. You’ll have to read the book to fully understand what the cover means. No, I’m not telling you. Snitches get stitches! The book is finally available for the buying and the reading Lulu.com. Buy it as soon as you can and let them know if you dig it!